Sun plays a very, very important role in our overall wellbeing. I am not saying anything new, am I? Everyone knows this. But this taken-for-granted-sun has really made its point. And how well! Till very recently, I did not really understand how sun influences our personal and mental well-being and how much can it really affect our mood. The full force of its power has recently dawned upon me. NZ is in midst of a full blown winter. This means we have very short days here and very long nights right now. For the past couple of weeks, sun has been rising at 7.45am (OMG, can you believe that?) and sets at 4.57pm. On most days, its gloomy, rainy and windy. Sun just gives us a formal guest appearnace once in a while and behaves like a celebrity who walks into a party late, knows his worth, charms everyone and leaves just as quickly. I am observing how depressing this can get. Not getting enough day light can seriously affect moods. When I wake up at 7, it is so dark, that I have to summon every little speck of power within me to leave the warm comfort of bed, and step into yet another cold, gloomy day. When I leave office at 5.15pm, it is so dark that it seems like 8pm. Ya. So basically, my exposure to sun is now limited to the weekends only, provided that sun decides to come out on a weekend. If it also decides to take a weekend off, it gets extremely dull and can also get quite depressing. With this, comes a crushing realization of just how powerful nature is. And how paradoxical life is! And how it makes you want things you do not have! When I was in India, I used to rant about how hot summers got. And now when I am in NZ, how much I crave for some sun and light. I really need a Vitamin D fix. Urgently. There have been studies on this unique condition called Seasonal Affective Disorder, or SAD. People with SAD, seem to have depressive mood spells in autum and winter. I am not getting into the whole scientific part of SAD. Am just saying that what so many people are experiencing is not baseless. But lets take charge of this and do small things to keep black mood at bay. Let us not let it affect us so much. It’s all in our mind, and we can control this. Try to be upbeat, and not have lingering, depressing thoughts. Stay happy. Train your mind to think happy thoughts. Surround yourself with postive people and people who love to laugh. You definitely do not need negative, overly critical, unreasonably judgemental, and people who constantly find reasons to complain. You need more positive aura around you. Listen to your favourite fast music. Your favourite peppy number. Have a go-to playlist for such days or listen to your favourite song in loop. Whichever way you like really. Steer clear of sad, depressing songs. Call, talk, meet, skype with your family and excahnge good conversations. It really lighthens the mood. Ease up on coffee and eat your favourite food. Watch classics and funny movies. Develop a hobby. If you already have one, lose yourself in it. And you may want to use more white lights at home as opposed to dim, yellow lights. 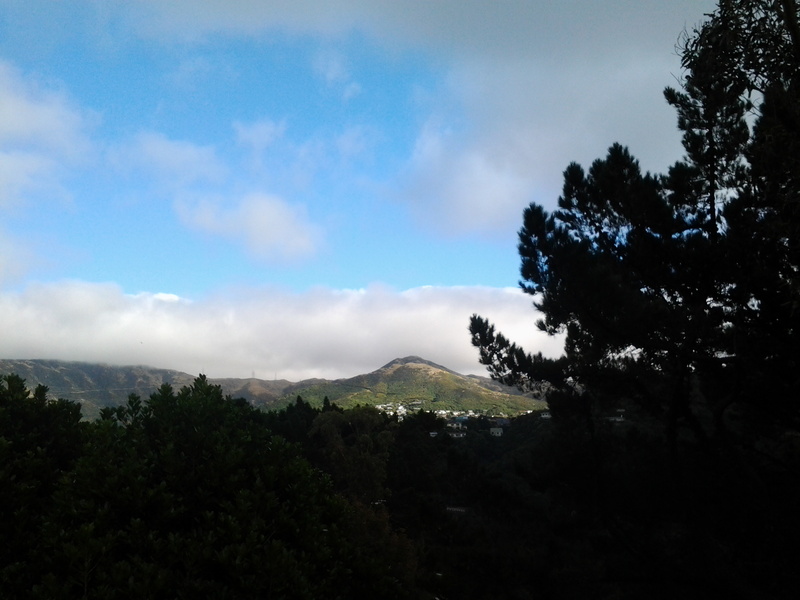 Today is one of those less windy days. It’s a beautiful morning here, with the sun casting its mellow glow on everything around me. 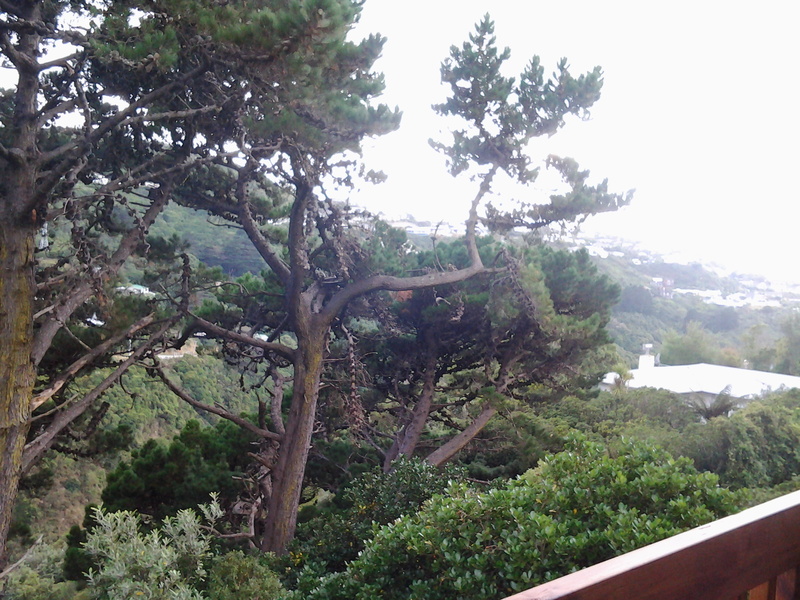 The view from outside my balcony is so beautiful, that every time I pass by it, I stop in tracks to get a good dekko. I freeze in place and crane my neck to get a good view of the surroundings and to capture them forever in my mind. I feel like filling my eyes with that picture and locking it in there like a screensaver, if such a thing was possible. It’s like I can’t get enough of this…this magnificent view. I want to fill my senses with this magnanimous splendor that surrounds me. 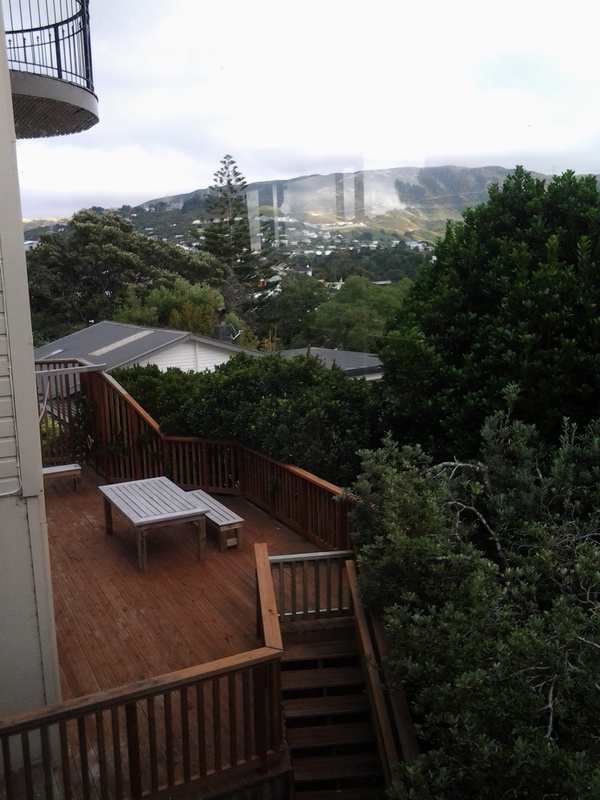 Who knows if my stay here in NZ is permanent or temporary? What I know for sure is, years later when I will recall upon this day, my mind will dig up this beautiful, breathtaking view from the recesses of my mind, and bring a big, BIG smile on my face. 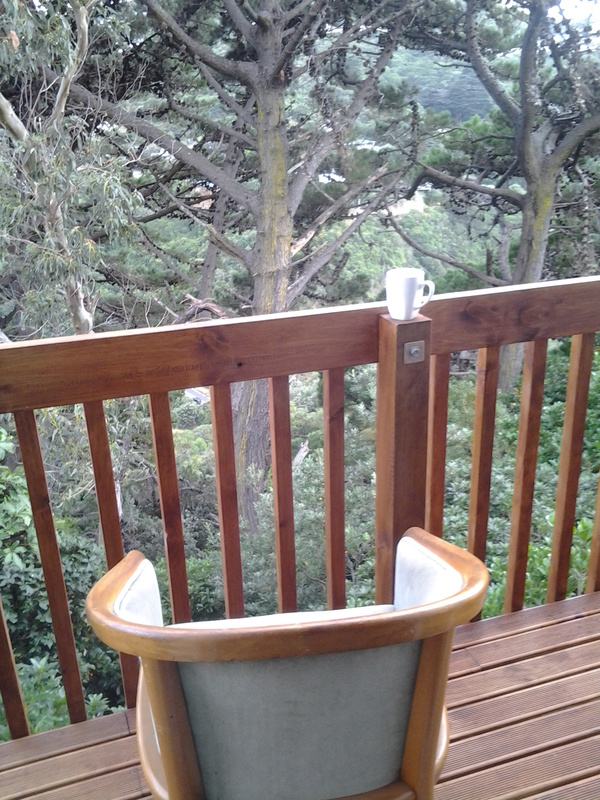 Today I brewed myself a steaming cup of coffee, dragged a chair in to the balcony and sat perched on it to get my eyeful of the view. Steaming hot coffee goes perfectly with the fine cool weather here. It was so rejuvenating, just to be looking out and sipping coffee without any care in the world. I must have been sitting there at least 40 minutes, just looking out and around, listening to the birds chirping. Don’t remember the last time I did such a thing, restless soul that I am! 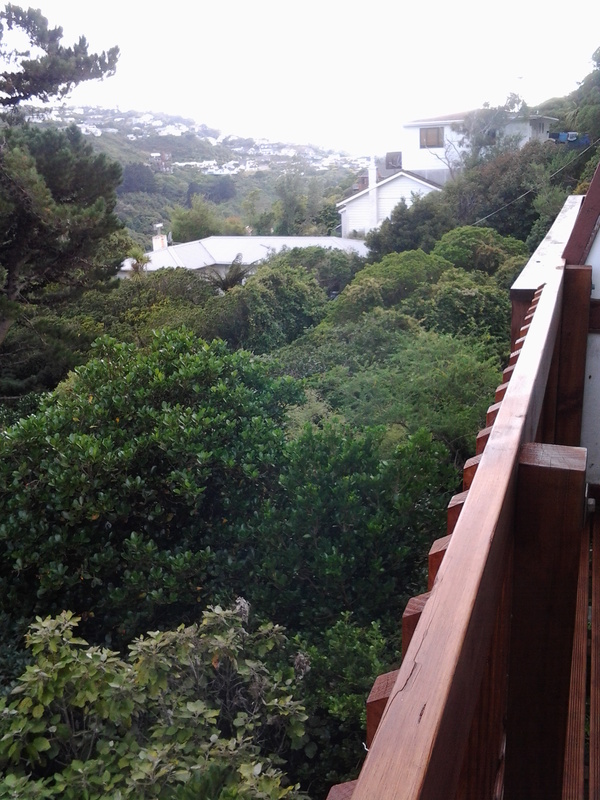 Here are a few snaps from the balcony, our private little heaven. See how foggy it looks? Our neighbours whom I haven’t said hello to…yet! Isn’t it beautiful? How can one not be happy here? Oh, and can you see those quaint little white houses dotting the hills? No? Then please take a closer look. How I wish I had a DSLR! Like right now. 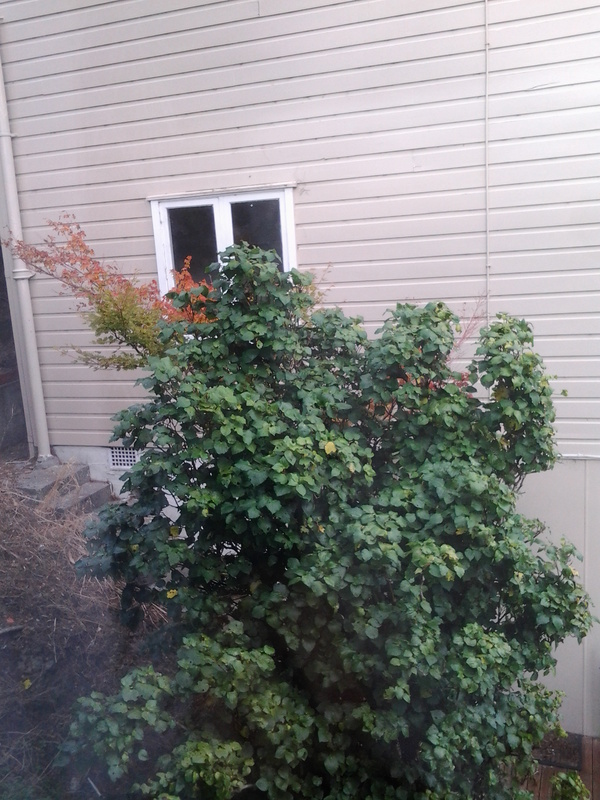 And in that last picture there, did you see those orange leaves? Autumn will be here soon, and all the green that you see here will turn into orange, yellow and red. Whooooooooooaaa …Oh my God, that will be so stunningly beautiful! I couldn’t have wished for a more perfect start for the day (or my married life for that matter). I feel like I am seeing the world around me through some rose-tinted glass. Is this real? I have to pinch myself to realize and to absorb how much my life has changed in a couple of months. I have left my parents, my family, my friends, my food, my job, my country and my entire former life behind, and here I am, in middle of this heaven. I am full of mixed, conflicting emotions at the moment…but they are mostly good feelings. Knowing that my family is happy back home, I am at peace here. It happened somewhere last year. The shift in my personality, the change in the pattern of my thoughts and the ensuing peace of mind. I stopped struggling with my thoughts and I tried to see things in a new positive light. Whatever-happens-happens-for-good kind of way. There were times in life, not too long ago from now, when I was at the lowest pit, angry with myself more than anyone else for poor choices I made, the consequences that followed, for things that didn’t go as I planned and for general directionless. Not anymore. So what changed? Nothing really, but I consciously decided to change the way I think. If you have read “The Secret” by Rhonda Byrne, you will know what I mean. It is an outstanding book, not your run-of-the-mill kind of self help book. It’s a must read. Because it doesn’t say anything out of ordinary or undoable. It gives a simple yet powerful message that our thoughts become our reality. So in order to change our life, we need to change our thoughts. For example, if we keep thinking that life is miserable, guess what, life will be miserable. It says that if we are grateful about things that we have, the person we are, the life we live, the things we enjoy then those wonderful things will multiply. And if not anything else, being grateful makes you happy and content deep within. This has worked for me. I am sure it will work for you also. If we ever sit back and think how many things we take for granted, we will realize there are indeed thousands of things we could be grateful for. I have started doing that. And this has changed me as a person. I am now more grateful for little things that life brings forward. I crib less; I am trying to be happy in every new situation. I am happy living alone for 10 hours every day in a new country, in a new big home, in a home that is on the hill, away from the city, where there is absolute silence and no one to talk to until the husband comes home. Oddly, I am at peace. If I was in this situation 2 years ago, I would have most certainly been crying or cribbing or complaining. But this new me is happy and content. With this, I am starting a new column on my blog, “Things I am grateful for”. As often as possible, I will come here and list things that I am absolutely grateful for. I am so grateful for this new day. Thank God for this new beautiful day. A bright, promising day. I am grateful that I got to live another splendid day. That means you have a big plan. That means there is a purpose why I am here. That means that I am meant to do something good and contribute in some way. That means my questions will be answered soon, my fears will be cast away soon and my doubts will be cleared some day. That also means I will get a chance to make new mistakes, and learn from them. May be today I am not in a position to understand why some things are happening the way they are, but eventually everything will fall in place, and when I will look back in retrospect I will realize everything happened for a bigger reason. I might meet someone new today, make a new friend, learn something new, do something silly. And all this is possible only because you gifted me this new day. Thank you so much.